Le Guillotine - thanoscardgamess jimdo page! 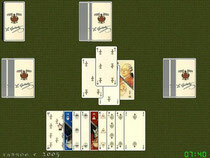 Le Guillotine is a plain trick-taking game played with a special deck of 60 cards, composed by 4 families of 15 numbered cards, ranking from 2 (lower) to 16 (higher). Dealing and playing is clockwise. The number of players can be from 3 to 6. Each card family has a different trump suit. If a player does not have the suit opened, he may trump or overtrump with the following order: Jacobins on Cordeliers, the latter on Girondins, the Girondins on Royaute, which in their turn trump the Jacobins.